True champions don’t make pit stops in victory lane – they live there. On January 16, 2019 an infantry of elite Sailfishing teams will converge on Sailfish Resort & Marina to prepare for Operation Sailfish - 2 days of battle against sailfish on the high seas in West Palm Beach, FL. As the first leg in the highly touted, Quest for the Crest Sailfish Series, each and every team will be on a mission to kickstart their series with a strong performance in the season opener. 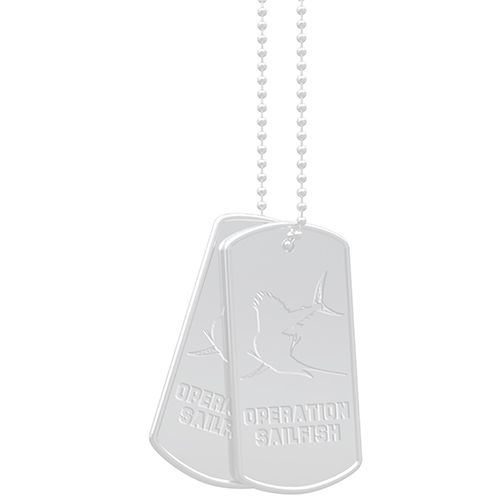 In addition to an estimated $800,000 purse, teams will vie for the Operation Sailfish dog tags. These tags will be reserved exclusively for the top team in the tournament. Consider it the champion’s id card if you will. Only 1 set will be awarded each year. Team Weez in the Keys wears them now. Who will emboss their name on this prestigious award in 2019? On January 16, 2019 an infantry of elite sailfishing teams will converge on Sailfish Resort & Marina to prepare for Operation Sailfish, Leg 1 of the highly touted Quest for the Crest Sailfish Series. Their mission: 2 days of battle against sailfish on the high seas off West Palm Beach, FL. What’s at stake? An $800,000 purse and the exclusive champions dog tags will have teams focused and ready to make every release count! The military undertones of Operation Sailfish were created in honor of true American heroes – our United States Military. A signature ‘Take a Hero Fishing Day’ is hosted during the tournament to thank them for their incredible service. Operation Sailfish proudly supports its charitable partner, Operation Homefront, a 501(c)(3) organization whose mission is to build strong, stable and secure military families that can thrive in the communities they’ve worked hard to protect. Show your pride for America and our military heroes and join us for Operation Sailfish on Jan 16-20!